You haven’t been a managed services provider long if you haven’t been questioned about having unfettered access to your client’s machines before. The beauty of a tool like Kaseya is that it allows you to remediate any issues swiftly, and often silently keeping your client’s business in motion without them really knowing much about what you did or why you did it. Most of the time they don’t care anyway. But what about the few times that they do care? What if they accuse you of doing something malicious to their systems, or even go so far as to bring you into court? 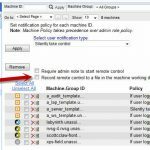 Aside from having a good insurance policy, it is probably a good idea to start tracking what you do to your customer’s machines and when. Kaseya offers a fantastic, largely unknown feature, which offers some solid “CYA” functionality. Kaseya has the ability to record all remote sessions in the form of screenshots every few seconds and then stitching them together into incredibly small video files which you can store for future reference. So what do recordings look like? They’re nothing special, really. More of a tool to see what happened during a remote session than a powerful Camtaisa Studio recording. The benefit is that they’re super small file sizes. An hour long session can squeeze into a file size of less than 10 Mbs – which is fantastic for historical sessions. Where are they stored? Kaseya stores them on the local machine in the KWorking directory. By default this directory is in C:\kworking\ but you can change the kworking directory. Here is where you find the machine’s kworking directory. How to manually set the Kaseya Working Directory. The files are stored as simple AVI files which you can easily access through Kaseya’s direct remote connection, or upload via Rsync, FTP, Dropbox, Box.net, Sugarsync, Egnyte, or your file sync of choice. It is also possible to write a script in Kaseya to sync the files (something we may do in the future, leave a comment if you’re interested in something like this). Oh, want to just record their screen and not be remote controlling it? You can do that too! 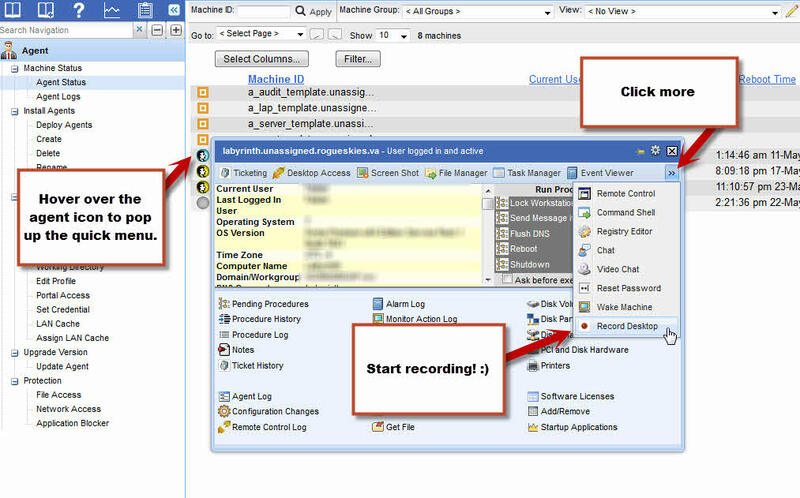 You can initiate remote screen recording through live connect at any time with the click of a button. 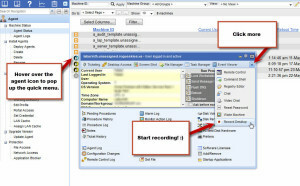 The image above shows how to manually initiate screen recording for any machine in Kaseya. Because of how small the files are, on a machine with decent hard drive space (such as a server) you could potentially leave screen recording on 24/7 if you were worried about someone connecting to the machine and messing around when you aren’t looking. But not sure if Kaseya could handle 24/7 recording. It would be an interesting experiment! Just be sure to turn the recording off by following the same directions above! So enable auto-screen recording and start keeping track of your remote sessions automatically, so when a question comes up, you have everything you need to protect yourself.